I stumbled across this way of cooking the chard in Camel CSA’s veg boxes this week in The Times. It’s from Lindsay Bareham‘s Dinner Tonight column. And very delicious it is too. 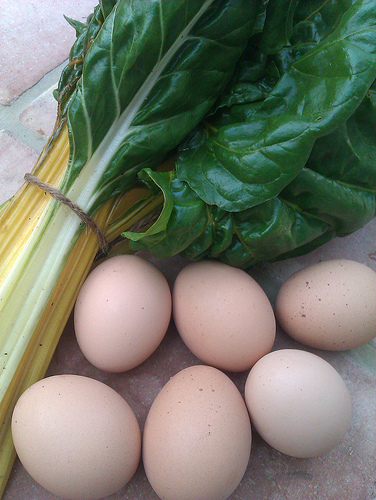 Trouchia is essentially an omelette made with chard, but it’s actually more chard than omelette. Lindsey describes it as “dense with green and just enough egg to bind it together, the spinach-meets-cabbage flavour pointed up brilliantly with garlic and a little Parmesan”. As a matter of interest, when most cooks make la trouchia (which is unique to the Nice area of France) they add a thinly-sliced onion when stir-frying the chard. Fold over each leaf and slice off the stalk (use these for another dish). Make a pile of leaves as you go. Using a large chef’s knife, shred the leaves finely. Place in a colander, rinse, then sprinkle with 1tsp salt. Leave for five minutes while you whisk the eggs in a bowl, seasoning lightly with salt and generously with black pepper. Add the Parmesan. Crack the garlic, flake away the skin, chop finely then crush to a paste. Fill a saute pan with water and boil. Rinse the chard and add to the boiling water for 10 seconds. Tip into a colander and hold under running water to cool, then squeeze dry with your hands or against the colander. Heat 2 tbsp oil in a frying pan over a medium heat. Add the garlic and fry quickly before adding the chard. Stir-fry constantly for about 10 minutes until soft and juicy. Stir thoroughly with a fork into the egg. Heat a small, non-stick frying pan over a high heat, add 1 tbsp oil , swirling it round the sides. Pour in the omelette mix, stirring and smoothing with a fork without touching the pan. Cook for a couple of minutes, then reduce the heat to very low, cover the pan and cook for about 8 minutes until set. Using the lid or a plate, quickly invert the pan. Add a little more oil, increase the heat, return the omelette and cook for a couple more minutes. Slide on to a plate and enjoy.